Genesis artist oil colour, is made with the highest quality pigments and produces vivid, light fast and permanent colouring on vinyl dolls, canvas and numerous other surfaces. The special Genesis spectrum of colours makes colour mixing fast and easy. Genesis colours speeds up the painting process by allowing you to dry colours in a convection/fan assisted oven. Unlike other oils that take 2 or more days to dry to the touch you can paint the next layer of your painting in just minutes. Genesis is a great value because each 1 ounce jar lasts a long time. These paints are versatile and can be mixed with other Genesis paints to make custom colours. 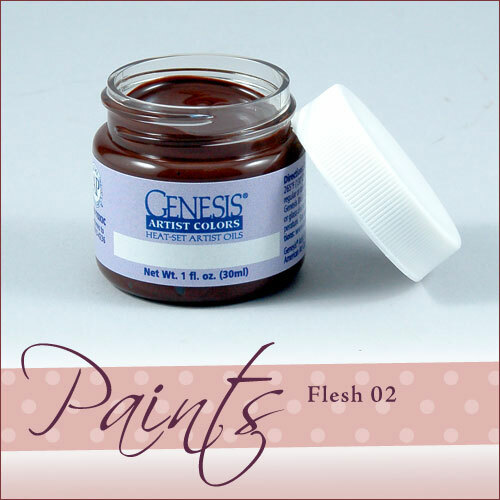 Genesis paint never dries out in the jar so there is no waste. Use your favorite techniques because Genesis can do it all. Safer than other oils, Genesis is Non-Toxic, Odour Free and Cleans up easily.